All holiday season long, online shoppers have seen heavily discounted Bluetooth headphone sets go on sale…and sell out faster than Thanos can erase half the universe. Be prepared for the same with this latest deal, a killer offer on the Paww WaveSound 3 noise-cancelling Bluetooth over-ear headphones. Regularly priced at $149.99, you can check at least one audiophile off your holiday list at half off, just $74.99. A check of the WaveSound 3’s specs show plenty to get excited about from a strictly audio standpoint. This state-of-the-art CSR chipset serves up pure Bluetooth 5.0 connectivity, the absolutely pinnacle of Bluetooth tech today. That assures twice the speed, four times the range, and eight times the message capacity of older Bluetooth systems. You’ll even stay connected to multiple devices at once, so shift back and forth between your headphones and your smart devices effortlessly. That premium connectivity is pumped right into your brain via 40mm Neodymium drivers that deliver a balanced, yet powerful audio presentation full of enhanced bass response, smooth mid-range levels, and crystal-clear highs. The superior sound delivery works in tandem with the unit’s active noise cancellation that blocks out up to 20dB of distracting outside noise. And that’s before even getting to the WaveSound 3’s ANC (ambient noise cancellation) technology. 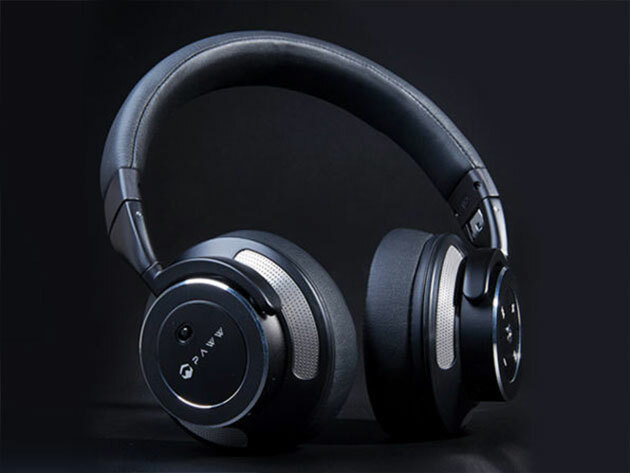 If you’re a frequent flyer, those features alone should tell you this is the perfect headphone set to curl up, block out your fellow travelers, and zone out to music, a movie or just some good old-fashioned peace and quiet. Built for portability, you can fold up the WaveSound 3s for easy storage or transport. And, between the ample ear padding as well as a carrying case sporting an extra layer of protection, your headphones will always travel safe and sound. Plus, it delivers a reliable 16 hours of big sound on a single charge. A $149.99 value, you can pick up this true holiday treat now at 50 percent off, all the way down to $74.99 with this limited-time deal. Want your products featured in The Tek Revue Deals Store? Learn more about how to sell your products online!